A soft place to land for the battle weary OFW. Trusting here you are doing fine and good. Thank you for taking the time to write insightful and meaningful answers to my Slambook questions. I especially and sincerely appreciate the time you spent in this effort and for recommending strategies to achieving them. Your advice was very helpful and gave some a new perspective to our future bloggers. Your professional strength will be a significant factor in building and developing of a group that I’m creating. Members will be trained to bring out their creativity and imagination to great heights as they come into our blogosphere world and take this blogger job. Reviewing and reading your inspiring story will lead them to study specialized knowledge in this area with opportunities for growth and will help recognize their strength that is inherent in them. And we are hoping this will build a better future, which is our primary concern for our citizen. This is the purpose why I’m very eager to begin this idea. I will always be grateful to bloggers like you who help me to improve our level of service as a Filipino blogger. You are a vital part of our continued growth and success in this blogosphere world. Any additional suggestion you may have would be welcome. I’ll update you in future progress of this book to be published and proceeds will be for a noble cause. I greatly appreciate the knowledge you have shared here. I am truly grateful for your support. I highly value your trust and will work hard to keep it. or other social network not mention above. 1. How, When and Why did you get into blogging industry? 2. How you came up with the name for it? 3. Do you blog for a job full time? What else do you do aside from blogging? 4. Did you choose to start blogging directly about your chosen niche or because you just saw a good way to make money from blogging? 5. How much time do you spend on work related to your blog(s) each week? 6. What do you find to be your biggest struggle as a blogger? 7. How does blogging help you, in terms of life and career? 8. How did you get to where you are now with your blog(s)? To what do you attribute your success? and what is the next goal you hope to achieve? 9. Where do you see your blog(s) and yourself in 5 years? 10. One of the hardest things for beginner bloggers is getting traffic. What tips can you give bloggers to drive traffic to a new blog? 11. What advice would you give to new bloggers wanting to start blogging and help them start out on a path to success? 12. Describe your blog in 10 words. Gracia Amor, A Multi-Award winner blogger; Presidential Award; Mass Media Advocacy Award, Philippine Expat Blog Award, and Most Outstanding Balikbayan Award. An OFW and Investment Literacy Advocate. Her first book, the Global Filipino Bloggers OFW Edition, reviewed and launched at Philippine Embassy Kuwait. Became a certified Registered Financial Planner of the Philippines (RFP), with specialization in Stock Market. Currently, a position PH stock trader in PSE. Digital Marketing Specialist. A proud founder of Teachers Specialist Org in Kuwait TSOK, Filipino Bloggers in Kuwait FBK. A Poet and a Photo hobbyist in between. Keep doing this and let us be an inspiration to others who have just started blogging. para ba itong isang contest para sa mga blogger? I agree with Dianne, this is a great idea. I hope it catches fire. This is nice. Will think about this. Nice Idea.. Keep it up..
Good one and surely will encourage bloggers to improve their works. i wanted to fill-up this one but i think i’m not worth it pa ! maybe after a few months . or a year . The proceeds is heroic. Brilliant idea. This is a great idea. Be a blessings to others always. I submitted since Aug 31, 2011 unfortunately my entry wasnt posted yet..
you can sign up too. Thanks. This seems like a great idea to create a community among bloggers. I’m sure a lot of bloggers would want to complete the slambook to broaden their network. This is a very interesting way of gathering information from other bloggers a sort of slambook type questions. Sharing is always a blessing. Keep it up, Gracia! This is a very interesting way of knowing other bloggers, thru this slambook type of questions and who doesn’t like answering one? Sharing is always a blessing. goodluck Grace. I agree! I am likewise thankful to my blogger friends who are always there to answer my questions and share their knowledge to me. Hi. I am the founder of Filipino Bloggers in Kuwait (FBK) and a compilation of this slambook is being prepared too. Will give updates on this blog. Thanks and have a good day. I’m sure the information you’ll gather from this “project’ will be useful to all bloggers. It’s my Masters course in UPD. I am a SPED teacher and a homeschooling parent. It is for my advocacy. I don’t think I can say that I am creating significant amount of money in blogging to categorize it as a career. I love to write so coming up with an original post is alright with me. However, I also summarize researches, conferences and seminars in my field so I guess the challenge is writing it in such a way that the readers will understand it with minimal jargon. Blogging gives me an opportunity to forward my advocacy and spread awareness about SPED. To quantify it I guess right now Special Education Philippines is on the Top 20 of Topblogs. I have been receiving inquiries about SPED from all over the Philippines as far as Visayas (hopefully, Mindanao too) I hope that this website can keep its reputation for being one of the most useful and purposeful educational tool here in the Philippines. In 5 years, I see the Special Education Philippines website being able to bridge the gap between the resources and recipients. I still see myself working with integrity and purposeful to my cause. Be a problem solver. Do not plagiarize. Special Education Philippines is a website – where you can find everything about SPED in our country. Tell us something random about yourself: Like to breath. It’s my favorite activity! I started blogging last year as a hobby, while managing my internet shop. OL.U.NID read as All you need. All you need is in my blog. Owner/Manager of my net shop. Love to write everything under the sun. My biggest struggle is getting people to my site. LIFE: meet so many friends. CAREER: Enjoy it while I have my product review because I can use my degree as a marketer. For this year, some of my blogs are monetizing now. So I am still waiting what will be my achievement here. Hahahahaha…difficult to say it. But I hope and pray it would turn out great! Know your blog niche first. I mean have knowledge about your blog topic. Give me all and I will write it down generally! I guess, hindi pa ako nabibilang sa mga dapat magsulat ng kanilang bio. I’ll just content myself to readingother bloggers bio. BTW, nice idea. Why not sign up po? That will be nice. http://www.diarynigracia.com/an-invitation-to-a-bloggermore-40/ here is the link. Thanks. This are interesting questions and would reveal a lot from bloggers participating. Thank you and they can answer from their hearts. I will wait for the updates of this blog regarding this post. Good idea. You’ve got some interesting questions right there! 😉 And it’s amazing that you’re trying to build a bond between Filipino bloggers in every corners of the world. Pinoy po kasi tayo 🙂 Thanks. it;s been a while since i visited this blog again, i guess it’s really nice to blog hop once in a while. Yes it is. We get to know other bloggers and their work. Thanks and Good Luck. Great idea to promote ones blog and be known to other site owners. It’s always nice to meet new people in the blogosphere. Bloggers have own ways to create something fresh and new for readers to appreciate the sites more. I love to write which was the reason why I started blogging in the first place. These are revealing questions that can help understand who the blogger really is, I admire the effort put into this endeavor. 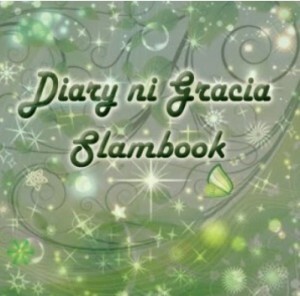 I would love to make a slambook like this and give it to my idol bloggers. Oh I am excited to read the replies of the bloggers who will answer this slambook. Thanks. pls visit the blog when you have time. This is a nice way of knowing other bloggers. Keep it up! © 2019 DIARY NI GRACIA. All rights reserved.